As original equipment manufacturers in the heavy equipment industry continue to demand ever more stringent requirements from their suppliers, aqueous parts washing specialist MecWash Systems Ltd has been able to help US-based Stewart Manufacturing not only meet these higher standards but also expand its production facility. Manufacturing and quality engineers at the machining house in Hermansville, Michigan, needed to take action after one of their best customers ratcheted up the cleanliness requirements for a family of cast iron turbo bearing housings that Stewart manufactures for them. The tighter cleanliness specifications meant that particles over 500 microns were no longer acceptable, gravimetric weight gain would be restricted to 25 milligrams, and no amount of abrasive material, in this case residual honing grit, would be allowed at all. 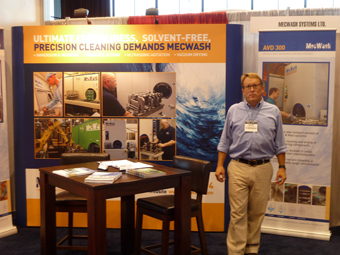 Bill Westbrook, North American Operations Manager for MecWash (pictured below), explained: “Where ten years ago particle sizes of 1,000 microns captured in a millipore patch test might have been acceptable, today it is not uncommon for heavy equipment OEMs to demand maximum particle sizes of 500 microns or even less as this customer required, as well as the new gravimetric limits on components that are critical to the fuel, oil, and airflow inside of engines, pumps, and compressors. “Before the customer made these changes to its cleanliness requirements, Stewart had cleaned these turbo bearing housings after honing inside a spray cabinet washer in a 15-minute cleaning cycle. “However, this cycle time was inexact because often the spray washer did not successfully clean the parts in a single cycle. Thus, the bearing housings were often rewashed in a second 15-minute process,” he added. Engineers at Stewart recognised that it frequently took two wash cycles to clean these housings in their spray cabinet and, now faced with much more stringent cleanliness requirements, they realised they needed a high-performance cleaning system to keep pace with production demands. They were looking for a system that could flood every drilled passage of the various housings multiple times during a cleaning cycle and one that could engage powerful ultrasonics to evacuate cast iron filings and all grit retained in the bearing housings after the honing process. 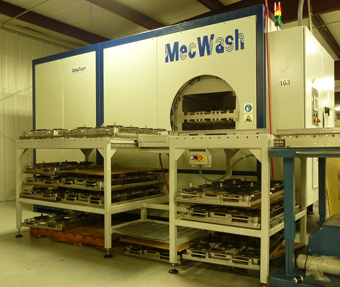 Stewart Manufacturing’s own customer purchased a MecWash aqueous parts cleaning system back in 2012 and was happy to recommend the UK-based company’s cleaning machines as offering a perfect solution to meet their changing and demanding needs. Bill Westbrook added: “At first, Stewart were interested in buying a MecWash Midi which they believed would achieve their cleaning throughput and also meet the new cleanliness requirements. “The MecWash Midi is a highly versatile, aqueous single chamber rotational cleaning system that features ultrasonic flood wash and rinse, immersion wash and rinse, spray wash and rinse, hot air dry, and vacuum dry to evaporate any retained water in small blind holes of components with more complex geometries. Stewart’s family of cast iron bearing housings did have blind holes, so a vacuum dry function was going to be an important part of an effective cleaning process. “As discussions about the MecWash Midi continued, however, Stewart’s business with their customer continued to expand and this led them to instead purchase a MecWash Maxi,” Bill added. The Maxi retains all of the high performance of the Midi, but is constructed with a much larger cleaning chamber, one that measures 24”H x 24”W x 40”L. As the customer gave Stewart more and more business, it was the MecWash Maxi that Stewart now needed in order to keep up with these expanding production requirements. Managing Director of MecWash, John Pattison, explains: “Critical to successfully cleaning these cast iron bearing housings was the requirement to be able to hold them firmly in place during the full rotation for the entire cleaning cycle. For this, MecWash designed four different purpose-built holding fixtures that would securely retain bearing housings measuring several different diameters. “For the smallest housing, the MecWash Maxi cleans 26 housings on two fixtures per 15-minute cleaning cycle. For the largest, the Maxi cleans 12 housings on two fixtures per 15-minute cycle. Across the different housings diameters, the Maxi can clean an average of 84 turbo bearing housings per hour. “Due to the Maxi’s high performance and huge cleaning capacity, we were able to offer Stewart a system that could both achieve their customer’s cleanliness requirements and surpass Stewart’s desired goal to be able to clean up to 80 turbo bearing housings per hour,” he added. The MecWash Maxi was installed and commissioned in Stewart’s manufacturing facility a year ago and, since that time, it has been cleaning turbo bearing housings on every shift virtually non-stop.